In continuation of my Belgian travel series (see this first post with general advice and this second one focusing on visiting lambic brewers and blenders) I've put together this post on visiting Belgian and French producers of saisons. Not all producers name their beers with these terms, but to me they are all excellent examples of beers that fit within the saison family. There are other brewers that one could say should be on this list, some justifiably so and some that I would say aren't my favorite. So I'll update this with more breweries as I visit more breweries if I feel they should be included. But whatever the case, this is not an exhaustive list of all the Belgian producers calling their beers saisons nor is it an exhaustive list of Belgian brewers whose beers I feel could accurately be termed saisons (even if the brewers don't use this term). As I mentioned in the first introductory travel post, I tend to get around Belgium by public transport and foot. So directions presented here reflect that. I might be one of few remaining analog travelers of my generation (I print or hand-draw maps, no data/gps on my phone). So many of you will probably get around differently. But this serves to show that it can be done without much knowledge of French or Flemish and by public transport, walking, and hand-drawn maps. So if you want to do it this way here's how I did it. Generally, getting to these breweries by public transport will make reaching lambic brewers/blenders seem easy. If you want to reach the following brewers without a car you'll often be walking 4+ km and/or using a combination of bus and walking from the nearest train station. But don't let that deter you. Taking some time in the Belgian and French countryside, or at least smaller villages, adds to the experience of visiting these breweries. The Brasserie a Vapeur mash tun, with steam engine at back right. Visits through saison country will show you that there is quite the range in terms of brewing systems being employed and the beers being made, and visits will give a good juxtaposition of the current state of saison. While maybe at one point saison was a beer for local consumption only and brewed by farmers, that is far from the case now. Of course that doesn't take anything away from how excellent the beers are and how great the brewers are, both in creating their beers and as genuinely nice and welcoming people. Just that the romanticized/nostalgic notion of saison combined with the modern flavor profiles we associate with these beers form an identity that might be more historical fiction than anything else. Again, that is not to place value judgments on which identity of saison is better. I'm just trying to more accurately identify what modern saison is. Some of these producers do make beers that could fall closer to the realm of historic saison as well. As a contrast to lambic producers, these breweries are mostly comparatively young and many were founded in the 1980s and 1990s. This wasn't an easy time for small brewers in Belgium and France and we can be thankful that the brewers fought through those difficulties and made it to today. You'll find that as with lambic, there are some unique and passionate people running some of these breweries. I'd recommend if you're making visits that you spend some time talking with brewers about more than just how they make beer. There are interesting stories from how they got started, how people reacted (and at times still react) to their beers, and what motivates them/inspires them as brewers. I guess the sort of passion that would drive one to open a small brewery as such breweries were dying out makes the brewers people who are worth talking to outside of their role as the producer of a beer you like. So in no particular order, here are some excellent Belgian and French producers of saisons. Some of the breweries are in farmhouses, some are in residential houses, and some are in warehouses. Some are new and some have been around for decades. Some make 'clean' beer (Saccharomyces only), some make mixed fermentation beer, and some do a bit of both (though not always intentionally). But whatever the case, and while some may not always make consistent beer, they all make beer that can be excellent. I talk a bit more about some of these breweries in brewery-specific blog posts(linked below) and a few years ago I put together a post with some general thoughts from visiting saison breweries in 2013-2014. At the brewery in 2011. Brasserie Dupont - Brasserie Dupont is responsible for introducing most of us to saison (if not directly then likely indirectly). While in farmland and in a farm building, they have certainly modernized from the farmhouse brewery days. But that shouldn't deter you from a visit and there is still some great stuff to see at the brewery. Visits in English at this point are not given by a brewer so if you are looking for some production secrets, you probably won't get any. Fortunately the production methods are well documented in books like Farmhouse Ales. But seeing the brewhouse, as well as a glimpse at some of the older equipment still in use or (relatively) recently retired is great. Their fermenter geometry is something very unique that you are unlikely to see almost anywhere else. And the fermenters have analog temperature probes on them so you can watch a tank bubble away at 36 C (96.8)! Overall a visit to Dupont falls more on the inspiration/seeing one of the icons side rather than lots of practical brewing info, but with a sharp eye/ear both can be found. So I would definitely recommend a trip there, but if you are looking for something more along the lines of discovery of new beers/info or talking with a brewer then this might not land at the top of your list. Short fermenters (in the wall, left) and more standard taller conditioning tanks (right). They also make cheese which is nice and can be found at some restaurants around Brussels (and presumably elsewhere). And they produce cheese with Cantillon lambic which is also very good and can be bought (when available) at Cantillon. If you want more info on the history of Dupont, here is a nice article by Chuck Cook. When to visit: The brewery gives tours on the first Saturday of the month, English tour at 11:30 (book in advance, though it sounds like drop-ins at this time are ok as long as space is permitting). While you can go there and have a beer at the cafe across the street (Les Caves Dupont) unless you are really prioritizing seeing the building and/or spending time in the Hainaut countryside I would wait to visit Dupont to coincide with a tour (note - it seems that since my visit to Les Caves in 2011 that they may not normally be open, so this might not be a safe bet). Getting there: The brewery is walkable from the Leuze train station (the same station that gets you walkably close to Brasserie a Vapeur). It's about 4.5 km from the station and mostly on one road (route here). The walking route is fine, though you'll be walking on the shoulder of the road for a while. Brasserie Thiriez - Brasserie Thiriez, run by Daniel Thiriez and founded in 1996, makes excellent beers fitting into both the Saison and Bière de Garde categories. The brewery is in the northwest corner of France, quite close to both the border with the West Flanders region of Belgium as well as the French city of Dunkirk. Located on the site of an old farm and a brewery (up until 1945), Thiriez does a good job of combining new and old. The bar is filled with breweriana in the old building side of the property while the brewing system and brewhouse building are relatively new. Thiriez yeast is believed to be the origin of the well known Wyeast 3711 French Saison yeast, though as I've written about in a post focusing on the brewery there are some clear differences. I think this yeast really shines with pale hoppy beers, and a good amount of the Thiriez lineup fits this description. They also do some barrel aging with brett and bacteria, which isn't especially common among saison brewers. The barrel aged beers I've had have been excellent and distinct, so I look forward to coming releases from this program. In addition to brewing great beer, Daniel knows a good bit about regional beer history and has a great collection of breweriana. This is a great stop to make and personally I have found more inspiration here than at just about any other European brewery I've been to. When to Visit: The brewery is generally open for visitors as long as you contact ahead of time, so the best time to visit is basically whenever you can. There are some special events at times (coming up soon is their 20th anniversary/open house on 21-May-16). Getting there: This might be the trickiest one of all by public transport from Brussels. From Brussels you can reach the Flemish town of De Panne/Adinkerke by train. This is not a fast trip, and it is only the beginning. There is also a De Lijn streetcar which connects the coastal towns of Belgium and ends on the south end at the De Panne station. So if you are along the coast already this shortens the trip. Adjacent to the De Panne train station is a DK bus stop (Adinquerque). DK bus is the bus service for Dunkirk and line 2 (you might see it labeled as 2a) connects the Flemish trains at De Panne/Adinkerke to the French trains at the Dunkirk station. From there you can catch a regional train to Esquelbecq, From the Esquelbecq station it is about a 2 km walk to the brewery. Some of these connections might be tight and while I've had it work out, I've also found myself waiting for the next 1/hour trip multiple times after missing a connection by minutes due to one leg running late. If you do this as a day trip from Brussels, and it is definitely doable, book all day for it (and a long one at that). All in all it is about a 4 hour trip one way from Brussels by public transport and walking if you don't get delayed by missing a connection and connections time out well. The trip is shortened quite a bit if you stay in western Flanders or northern France for a night or two. Or you could go by car, but then you'd miss out on all the fun. You can also get there by bike from Poperinge (which has a train station and bike rentals). The trip is about 20-25 km 1 way and mostly flat. Biking through farmland is a great way to get yourself ready for a refreshing saison! Poperinge is connected with major Flemish cities by 1 train/hour and it is both in the center of Belgian hop growing and the closest point to Westvleteren/St. Sixtus by train, so as a beer tourist you may find yourself in the area anyway. The brewery (back left), new warehouse space (front left) and the cafe building (right) in May 2015. Au Baron's cafe/restaurant/brewery with a riverside patio. Brasserie au Baron - Brasserie au Baron is another excellent brewer of beers fitting into both the Saison and Bière de Garde realms in northern France (though they are only a couple hundred meters from the Belgian border). They make simple, excellent beers along with great food and in a beautiful setting. The brewery started in 1989 and current head brewer Xavier took over from his father. Their Cuvée des Jonquilles fits into what many would consider a classic saison, but saison doesn't show up on the label. Their amber and brune both clearly say saison, and their elevated maltyness might remind some of nice top fermented bières de garde (they are still pleasantly dry and crisp). This all goes to show that while we like to apply these names as categories with specific meanings, the words have literal meanings in French that aren't restricted to one style of beer, and these sorts of breweries are not bound by strict style definitions. So not everyone follows these naming conventions, and with fair reason. One of my favorite moments in talking with Xavier was while discussing the modern identity of saison and application of style terms (especially outside of Belgium/France) when he said "Saison is a rubbish style!" and then mentioned all the things that some brewers call a saison (beers like saison-ipas or super brett-forward beers). Whatever name/label you wish to use, Au Baron makes beers of delicacy, simplicity and grace. When to Visit: The brewery is open for visits Monday through Thursday from 9:00-16:00 and Friday and Saturday from 10:00-15:00. Email ahead to schedule a visit. There is a restaurant there serving beers and good food and selling bottles to go. In warmer months the patio is open along the Honelle (called Hogneau in France). This would be a great place to enjoy Baron beers over lunch. Getting there: This is also a more tricky one to get to without a car. By train from Brussels you can get to the Quievrain station. From there it is either a 10 km walk to the brewery, or you can catch TEC bus #29' to Roisin (~20 min, roughly one every 1.5 hours on weekdays, though the schedule is a bit erratic so check it). From Roisin it's a 4 km walk to the brewery. There is some signage as you make your way out of the center of Roisin. Following google maps led me into a nature preserve and the 'road' was actually a thin trail that was a touch on the muddy side. It still led straight to the brewery, but I was a bit apprehensive at first. Brasserie a Vapeur - Founded/taken over from the closed Biset-Cuvelier brewery in 1984 by Jean-Louis Dits, Brasserie a Vapeur was at the leading edge of the wave of breweries making saisons which opened in the 1980s and 1990s. The 1980s and 1990s were a hard time to open smaller specialty breweries in Belgium and (especially) France. On the whole these sorts of breweries were a dying breed and the idea to found a new specialty brewery was a bit crazy. If you discuss the origins of these breweries with their owners you'll find a common thread of cooperation/sharing among them, both when they were opening up as well as now. To survive as a new small brewer in that time required sharing of resources and knowledge with fellow brewers. Some established larger breweries also helped out with supplies and ingredients in small quantities as some companies were not interested in selling in such small volumes. Multiple other brewers from this list point to Jean-Louis as someone who helped them out when they got started. The Brasserie a Vapeur steam engine. Visiting during a brewday is something truly amazing. I've written a good deal about that in the post about visiting them so I'll only write about that briefly here. Brewing at a Vapeur is not exact. They brew once per month using old iron equipment and a steam engine. The saison is brewed once per year so if you are visiting for a brewday chances are you'll be there for Vapeur en Folie or Cochonne. Their brewery is the sort of thing you rarely see at all, let alone in use. From the moment you walk in the door the sticky heat of the steam engine and the smell of grease hit you hard. This, combined with the rhythmic whistling of the steam engine are something I'll never forget. A trip across the uneven worn brick floor to the open topped iron mash tun to watch the water to grist ratio adjusted by feel (by using a hand to assess the consistency and temperature) should confirm if you didn't know it already that you are witnessing pieces of brewing from a different era. When to visit: They are open for the public during their brew days on the last Saturday of the month. You'll need to book in advance, and something like EUR 35 covers your spot watching the brew as well as all you can drink Vapeur beer and all you can eat from an excellent lunch. When I was there, offerings included slow cooked pork, home made bread, ~25 different Belgian cheeses, salmon, soup, etc. It was certainly worth it. Information is given in French, though if you speak to one of the brewers/assistants they will likely be able to give you a rundown of what is going on in English. Brewers/assistants include Jean-Louis or his daughter as well as a main assistant Bernard, and then Jean-Louis's wife and possibly a young brewer or two living nearby who are planning their own brewery in the region (note that Bernard, while very welcoming, speaks only French). Getting there: You can reach the brewery by taking a train to Leuze, one stop away from Tournai(FR)/Doornik(NL). There is regular train service from Brussels to Tournai (1/hour) and these trains stop in Leuze just before Tournai. From the Leuze station it is a pleasant 4 km walk through farmland to the the brewery in the town of Pipaix. There are a couple possible routes you can take. This route is the most direct but the roads aren't always marked excellently, so if you miss the right turn in the fields (it is pretty much the only road) then you can go the long way through town. As I mentioned in the post on visiting a Vapeur, I recommend getting to the brewery early if you are there for a brew day. In order to easily do that and if you don't like waking up very early, it might be best to spend the night in Tournai before hand. It's a reasonably pretty city with a very old cathedral and an old belfry. There is a youth hostel there and there is also a bar with a well curated tap selection plus bottles along the river (Saison Dupont and De Ranke hop harvest on tap when I was last there, the bar is roughly here if my hazy memory is correct) as well as specialty beer shop which will certainly have enough to keep you entertained for a few nights in the way of saisons and lambics. Brasserie Blaugies - I have not yet made a visit, so I can't offer much insight here. I'll update when/if I've made a visit (nothing is planned for the near future). I can say that a couple friends have reported (from multiple visits) that this is a great place to visit and that it ranks at/near the top of their brewery visits in Belgium/France. The brewery is not especially set up for tours, but the restaurant Le Fourquet is open Wednesday-Sunday for lunch and dinner. Word on the street is that Pierre-Alex, the original brewer and father of the current brewer (Kevin) and restaurant owner (Cedric) likes to hang around the restaurant and grill. So a visit to the restaurant, on top of being a good stop for lunch/dinner, may allow you to talk a bit of beer and/or peek into the brewery. Fantome - Fantome was founded in 1988 by Dany Prignon to do something to bring more notoriety to his town. In the Ardennes and separated from classic saison country, the brewery stands out from other saison breweries in more than just its location. Foreign interest in Fantome beers is much higher than Belgian interest and most of Dany's production is exported. Furthermore much of it is spoken for before it is released. He receives a lot of visitors (especially in summer), sometimes too many. Visiting the brewery shows a contrast to other producers. Dany's system is older than most others (excepting a Vapeur) and a bit pieced together rather than the more complete and modern systems seen at many other breweries. The Fantome setup is perfectly in line with the spirit of Fantome. The recognizable Brasserie Fantome ghost. Fantome brews a wide variety of beers (some regular seasonals, some less seasonal but re-occurring releases, and a healthy number of one-offs) generally with unique and mysterious spicing and generally stronger than the typical saison (usually sitting at 8%). The beers often have the influence of brett and/or bacteria, and this can lead to some truly remarkable beers and sometimes some not as excellent beers. However one feels about this, I think it is safe to say that the best Fantome beers I've had have been some of my favorite saisons. And they provided early inspiration for me to move past thinking of saison only as something like Saison Dupont (which is an excellent beer, but is not the whole scope of saisons). Fantome is an important piece in the puzzle of saison beers and brewing. I discuss their beers a bit more in my post about general thoughts from saison brewery visits. When to visit: Go when you can. They take visitors for tours on weekends/holidays when available and with a booking in advance. There are some special events (see the Confrérie page of their website) including Santé release weekend (August), an old car rally (May) and a carnival in February, It seems that some also meet on Sunday evenings at the brewery cafe. I don't have personal experience from any of these events. Getting there: You can take a train to Melreux from Brussels (it will require at least one change). From there it is about 6 km of walking, making this a tricky destination. If you're lucky you might get a ride. This was the case for me both directions so I haven't had to walk between the station and Fantome. introduction to a saison enthusiast. He is probably the world's foremost expert on saison history and his chapter on this topic in Markowski's Farmhouse Ales is by far the best English-language source of information on the topic. 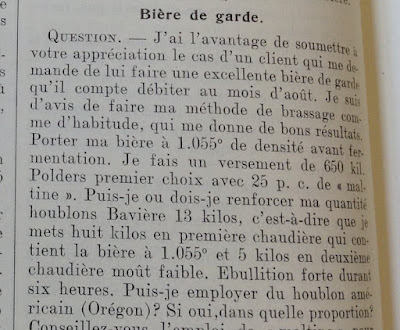 It is easy to underestimate the amount of work that went into this chapter, but if you ever turn to French language brewing sources from the 1800s (or earlier or even in the 1900s) you'll see how frustratingly difficult it can be to find information about historic saisons. And often the info you do find will be incomplete and can contradict either your other sources or could be self-contradictory within one source. The simple truth is that writers at the time didn't care about poor rural breweries. And the information Yvan has compiled to come up with a coherent history is truly remarkable. A short and wide De La Senne fermenter. Brasserie De La Senne has earned their place as a leader of a new and innovative wave of Belgian brewers who are breaking from classic Belgian beers of today like sweeter blondes, dubbels, tripels, etc. by making modern beers with historical connections. They make beers that they call saison, but they also make others that fit with saison characteristics without using the name. Hop-forward and low strength beers like Taras Boubla remind today's drinkers that Belgian beer can be hoppy and light (as was common historically) and fit well within the historical roots of saison. At their core, De La Senne beers are for people who like drinking beer and De La Senne shows that beer can have complex flavor while maintaining a balance and drinkability. I won't say too much more about them here but if you are interested Topher at Farmhouse Beer Blog has a nice write up (including discussion of their fermenter geometry, which is unique among modern brewers). And there are also some good interviews out there like this old one by the Shelton Brothers with Yvan and the other co-founder Bernard Leboucq and this more recent one from the Beer Temple. When to visit: The brewery is open from 9-3 (office 8-4) Monday through Friday and they have a bar/tasting room. The aren't set up to receive individual visits but can take groups of at least 15 people with a reservation. Getting there: You can reach the brewery by MVIB/STIB (Brussels public transit) streetcar from the Weststation metro station in Brussels. From there take tram line 82 to the Molenbeek cemetery stop. Then it is a quick walk to the brewery which is in an warehouse space to the right/north. Note that they are moving locations within the next two years and that these instructions/descriptions are for the Molenbeek location. Seizoensbrouwerij Vandewalle - Although a new brewery (first brew was fall 2011) and in the Flemish region of Belgium, Seizoensbrouwerij Vandewalle fits well with the spirit and characteristics of saison. Chris Vandewalle is the owner/brewer and he is the 10th generation in a line of brewers. The brewery is a small and focused operation, with Chris taking the time to produce exactly the beer he wants. He puts an emphasis on local products in his beers, and on the whole he makes a point to promote his region. There are some unique production methods in use here (as I mention in this post about the brewery) and checking them out might be especially interesting for inspiration for smaller brewers and home brewers. Chris makes 4 beers - Reninge Bitter Blond, Oud Bruin, Kriek and Bitter Blond a Lambiek. The Reninge Bitter Blond is a dry and very hoppy blond beer that seems to match the sort of descriptions that Yvan De Baets gives in his history of saison chapter - a beer that when younger was very bitter. Vandewalle also produces a version of this beer blended with lambic (Reninge Bitter Blond a Lambiek) which again aligns with saison brewing history and provides an interesting balance of hoppy and mixed-fermentation beers that have a vinous character and light acidity. Vandewalle is quite the beer historian, so it should come as no surprise that he is producing great beers which fit with historical Belgian brewing. Barrels for Kriek at Vandewalle. Chris is a very welcoming brewer and is happy to share his story. A visit to the brewery is packed full of local history, beer history, brewer philosophy, unique production, and good beers. Go expecting to learn, especially about how the local history influenced regional brewing. I'll try to get a post focused on visiting Seizoensbrouwerij Vandewalle and I'll update this post with a link if/when I do. When to visit: Visits need to be arranged in advance, so contact the brewery for timing. They may take solo visits here and there (I was fortunate to have that opportunity) but generally visits are better suited for medium to small groups as there is a minimum cost of EUR 80, which I'm told includes a tasting of beers paired with local food). Getting there: The most convenient/pleasant way I found to get there was renting a bike in Poperinge and heading through the hop fields (with a quick stop at Westvleteren/St. Sixtus for a glass of blond) to the brewery. As an aside, the Reninge bitter blond is massively more hoppy than the Westvleteren blond. The nearest train station is Diksmuide (the same station one would go to in order to visit De Dolle, and on the line between Brussels and De Panne which you would use to get to Thiriez by train). From there you can take De Lijn route #24 to Reninge and the brewery, though note that this bus has very limited hours and it may not line up with your trip. So the bike plan is probably safest. Brouwerij De Glazen Toren - In Flemish-speaking Belgium and closer to traditional lambic territory that the traditional saison region of Hainaut, Brouwerij De Glazen Toren is a comparatively newer arrival in Belgian saison brewing. They opened in 2004 as a joint venture of 3 friends. Their brewery is shiny and generally modern, although there are some unique differences from conventional breweries. Their fermenter aspect ratios are basically the opposite of someone like Dupont or De La Senne. They also don't have temperature control (or at least didn't a couple years ago) but will at times wrap insulation around tanks to keep them warm (see the tank on the right in the photo below). Their saison follows very much along the lines of Dupont's saison - pale, crisply hoppy and 'clean' fermentation (no brett or bacteria). They don't really offer tours and they have no tasting room/bar. I've had poor success emailing them and it's one of the only breweries I visited where I didn't feel especially welcome. After waiting for a bit I was able to ask some questions and by the end I felt more welcome. In the end I had a nice trip and got to talk with the owners/brewers for a fair bit, but I can't say that this is a reliable destination for getting some brewing info/talking about beer and drinking a beer. Tall and thin fermenters at De Glazen Toren. When to visit: They are open on Friday afternoons and Saturdays. They aren't really set up to welcome guests, so the term 'visiting' is used loosely. In general their opening hours are for people to show up, buy bottles to take home, and then leave. Although I did have a good time in the end, based on my experience I can't recommend visiting and I would put this pretty far down the priority list unless you have a very strong reason to visit this specific brewery. Things may have changed since I was there in 2014. Getting there: You can take a De Lijn bus #81 or #91 from Aalst or walk from the Ede station (a bit over 2 km, trains from Brussels to Ede only on weekdays). The brewery is in a residential area and coming from a North American background it was sort of surprising to see a line of houses, with one in the middle (still in a house-type building) that is a brewery. I'll end with a list of some other breweries you might want to consider, but that I have not been to so I can't add anything about them. Brasserie de Cazeau (outside of Tournai) - the brewery dates back to the 1700s. Ok, that's it for now. I'll update the list and/or add to the notes as I make more visits. Happy travels! Sunrise over Wallonian fields with a mound of sugar beets.